"Your Dream"...We make it Come True!" Our Company foundation is built on a strong commitment to Quality, Safety, Innovation, Flexibility and Customer Satisfaction. We specialize in all aspects of Commercial paving that includes both large and smaller contracts. Our experience and expertise enable us to provide excellent results in a timely manner. Every single project undertaken by us bears the GOD's OWN Builders Stamp of Quality. We not only make our buildings that have great aesthetic appeal, Also take great efforts to ensure they are safe and sturdy. Please feel free to browse our website and learn more About Us! Be sure and stop by our office at Pookunam, Thrissur for all your options in building your next Dream REALESTATE Project! Amala Nagar is just 2 kms from Puzhakkal, the new hub of developments, and provides easy access to everything one needs and wants like educational institutions, markets, supermarkets, railway station, hotels, bus stations and above all a premium residential destination of future. 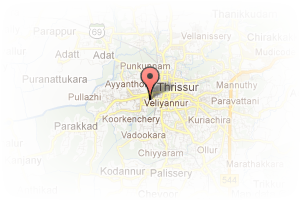 Being one of the fastest growing residential havens of Thrissur, the value of this location is steadily on the ascent. There is also more to enjoy like good air, water and a healthy green environment that envelopes your life. Be closely knit, well that's what great works gift us! Address: Raasvi Tower, Pookunnam, Punkunnam, Thrissur, Kerala, India. This Builder Profile page for "GOD's Own Properties & Developers" has been created by PropertyWala.com. 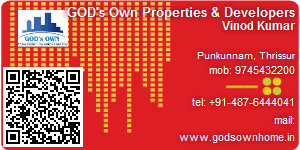 "GOD's Own Properties & Developers" is not endorsed by or affiliated with PropertyWala.com. For questions regarding Builder Profiles on PropertyWala.com please contact us.